Day 3 : OOTD | Singapore Diaries | TSD in Singapore | TSD Travels | The Shopaholic Diaries - Indian Fashion, Shopping and Lifestyle Blog ! 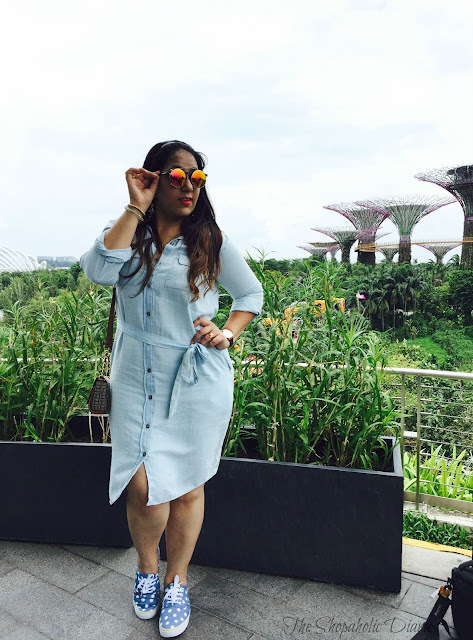 Here's the third post from my Singapore diaries along with pictures of one of my favorite outfits that I wore during my trip. While headed out for a city tour and a day full of shopping on a sunny day, I decided to wear a breezy and comfortable outfit so that I could explore the city with ease. I chose to wear this denim dress from ZARA as you can never go wrong with an all-over denim dress whether you chose to wear it for a lunch date or a day out for shopping. To add more comfort factor, I styled it with a pair of printed sneakers that I had purchased from H&M in Singapore. My go-to bag during my trip was this cute Tommy Hilfiger sling bag which is small but spacious enough to store a small wallet, passport and sunglasses. After a hearty meal at our hotel, we headed for a city tour in one of the hop-on hop-off buses that take you through the major attractions across the city. We explored the Gardens by the Bay, Shoppes mall, Merlion Park, Orchard Road market, Bugis Street and Anchor Point. Merlion Park is a major tourist attraction in Singapore located at One Fullerton, and has the iconic Merlion spouting water from its mouth, and ofcourse one of the main locations to get those Instagram-worthy clicks. Gardens by the Bay is an awe-inspiring park spanning 101 hectares in central Singapore, adjacent to the Marina Reservoir. It is famous for its three waterfront gardens: Bay South Garden, Bay East Garden and Bay Central Garden that offer a breathtaking experience of nature. Bugis Street is home to the largest local market in Singapore where you can shop for souvenirs, food, clothes, shoes and basically everything at cheap prices. I ended my day with loads of shopping (pictures coming in next post) from Anchor Point and an amazing dessert from Gelatissimo - a famous ice-cream point in Singapore. Looking cool in these pics, I hope you have enjoyed a lot on that trip. It is my favorite tour place and I am also planning to visit there soon, I have seen lots of place of Singapore on your post. Enjoy the memorable Food Tour Singapore to visit on Wok ‘n’ Stroll.